I agree. I’m sure CCP is aware of all of these issues as well and it will be really interesting to see how it plays out. I wish there was a PC version though. Not all Eve players are strictly Eve players after all. It really seems like a huge risk, but just imagine if it actually worked as intended. It would just be an amazing and revolutionary thing to watch! I agree. There is a lot of eye candy put into DUST 514 that will be a big attraction to those drawn to an FPS, but this venture has a very strong potential of flopping. 1. If this is a console game, what good is it for the regular EVE player? 2. How are they going to get the patches and updates if it’s a console game? 3. With the EVE Universe being so big, are they going to take a planet with only 1-2 fighters? 4. 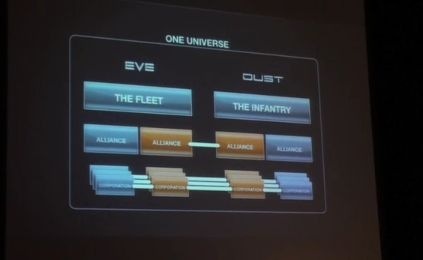 Is this also going to be made available to the PC/Mac players of EVE Online? 5. Is this THEIR answer to WiS?!?!?! CCP would have done better by opening this to the EVE Online player, and focused on WiS. Until they get Ambulation up and running, DUST 514 is going to be nothing more than a distraction from the real task at hand, EVE Online. Apparently patches are possible for console games. From what I read… I don’t have personal experience ;). I don’t think the communities will be as integrated as you might fear Morphisat. 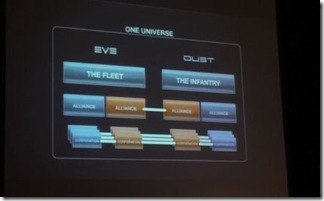 Interaction between them will probably be restricted to forums and a system similar to the contracts system already in use in EVE. I don’t think an orbiting pilot will be able to give direct orders to those on the ground via an in-game route (though vent and TS may be used by the more organised alliances.) As to the impact it will have on actual EVE gameplay for the average player, frankly I don’t think they’ll notice. Those high up in the command structures of alliances however will make use of it no doubt and I foresee them quite quickly taking a leading role in driving Dust’s use as a means of gaining sov. As you say though, from now on its a game of wait and see. I respectfully disagree that this is a bad idea or one destined for failure. I don’t think for a moment that CCP is uninformed about what makes a console FPS game a sucess. And it’s fairly clear from what was said in that video that they understand it’s not the same thing that makes a PC MMO like EVE a sucess. This whole project is a diversification of CCP as a gaming company while, at the same time, a huge effort to expand and synergize both games. Look, you’re an EVE pod pilot. WTF do you care about a bunch of dusty planet bound grunts doing gravity well combat. All you need to know is that if you higher this team to go to this planet and let them do thier thing….you can exercise control over this system! Now, down the road you may find significant success with this particular team of ground pounders and eak out a better deal that benefits both of you. They get more fights, you get more sovereignty. I think you are expecting TOO MUCH interactivity between the two games. Dust 514 should be only used for fraction warfare corps and maybe major coalition which i doubt.But thats just my idea so i dunno how dust 514 is gonna work. I think the idea is genius. But there is one thing in my mind that they have to avoid. Total control of the galaxy. What if on dust one faction is dominant and wins every battle they fight. They own the universe. Then what. They have to avoid this.